Everyone at Bestsmiles is part of an extended, caring family. As we strive to provide an excellent service to our patients, we also emphasize the importance of customer service between each other. It is all part of our people-oriented mission. Dr. Miyuki Nagata earned Doctor of Dental Surgery from the University of Maryland Dental School after completing her bachelor degree from Florida Atlantic University. She then completed a year of post graduate study at Mt. Sinai Medical Center in Miami Beach, Florida. Dr.Nagata believes in her passion and skill in providing comprehensive dental care in a very relaxed and soothing environment. She strives to provide the best in service and comfort in all our procedures including painless cleanings and fillings, cosmetic dentistry, bonding and white fillings,veneers, crowns, implants and more. Dr. Nagata believes that giving back to the community is essential to enjoying life. She is involved in volunteering as a dentist for local underprivileged youth as well as traveling abroad to do dentistry in the Dominican Republic with a community health mission program. She is committed to lifelong learning and has completed many continuing dental education courses to broaden her clinical knowledge. Dr. Nagata strongly believes that continuing dental education is vital to perfecting her skills as a clinician and keeping up with ever-advancing technology in the field of dentistry. Dr. Miyuki Nagata was born in Tokyo, Japan. She moved to Florida in 1988 to pursue graduate studies. She is fluent in both English and Japanese. 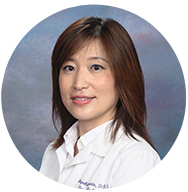 Dr. Nagata’s other interests include cooking, traveling, playing the cello and spending time with her daughter.